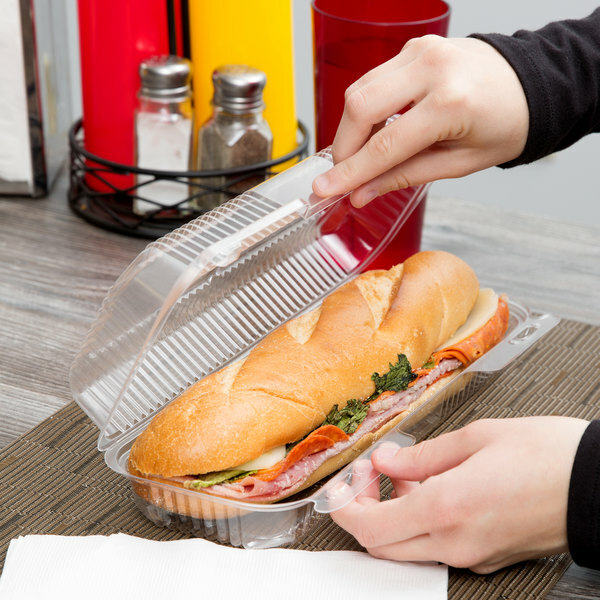 Keep your customers' to-go items fresh and secure with this Durable Packaging PXT-350 plastic container. 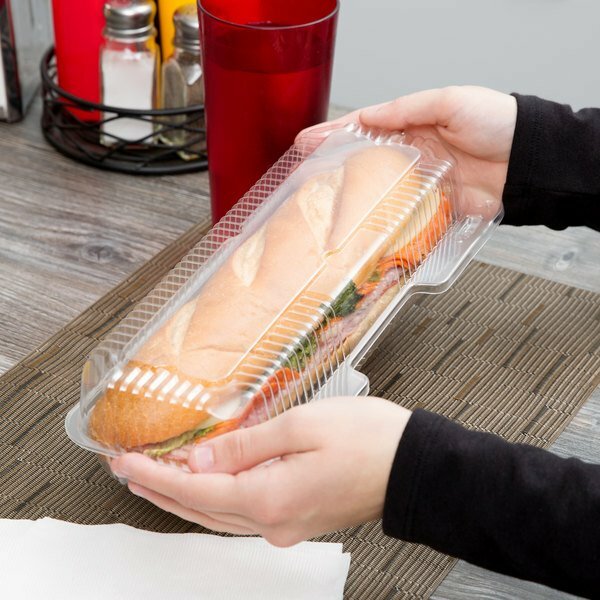 Send hoagies, strudels, hot dogs, and other delicious food home with your customers in this clear hinged container! Measuring 12" x 5" x 3", this container is perfectly sized for a wide variety of products. It is a tremendous addition to delis, supermarkets, cafes, and virtually any other operation that offers take-out. "I absolutely love these containers!! They are perfectly sized and very durable. My customers love them too!! I will definitely continue to order this product and many others!!" 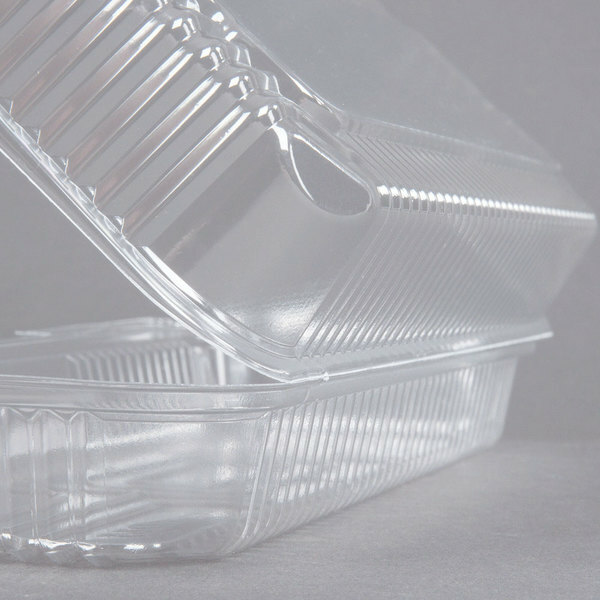 The container's crystal clear OPS construction allows customers to immediately identify all of your best take-out offerings. This allows your sweet baked goods and colorful, savory subs to effectively market themselves and boost impulse sales. The hinged design keeps the lid and container attached, effectively saving storage space by nesting snugly together. The reliable barlock closure provides a solid seal to maintain product freshness and prevent accidental opening during transportation. I absolutely love these boxes. The fit is perfect for my pumpkin rolls. They have the perfect height and depth. The boxes are made of very sturdy material which is great because I was able to reopen the box without the closure tabs breaking of cracking. Will be ordering more!! 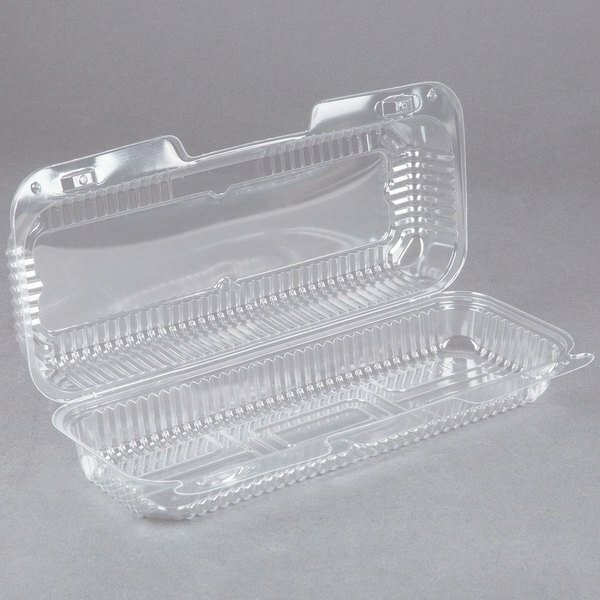 These to go containers are a godsend for my business. We sell dessert crepes at my shop and these containers are the perfect length for our crepes. They are also pretty sturdy. 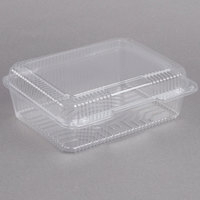 Very nice clean clear and sturdy container. Freezer friendly too! Great presention for a lot of different foods and desserts. Great container for a dozen mini cupcakes. 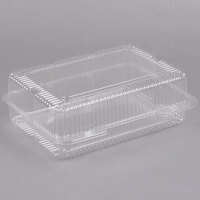 This container works great for packaging pumpkin rolls! Plastic was a great quality, and stacked very well. Also works great for subs, cookies, and other baked goods. We use these containers more than any other size because everything fits in it perfectly! We package muffins, mini bread loaves, petit fours, scones, etc in them. I was impressed with how durable they were, especially with their long shape. But they held up really well when stacked in columns of 5+ and didn't crumble under the weight. Opening and closing the container is easy and have had zero problems with cracking or breaking. Perfect size, good quality, good price, and not sure the bakery could do without them! This is the worst product I have ever bought. The spines break as soon as you try to close them. From now on I'm only buying Dart products. Super bad! Thank you for the feedback! We're sorry these were such a disappointment. A Customer Solutions Representative will contact you about the defective containers. I absolutely love these containers!! They are perfectly sized and very durable. My customers love them too!! I will definitely continue to order this product and many others!! 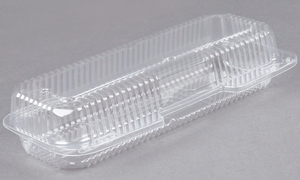 These containers are great for our foot long sausage dogs. Customers love that they can see there food. They are very durable and we love them. Our store recently started doing hot subs (grinders / hoagies) for sale to customers looking for a hot quick meal. These containers support the product completely. Being clear, they show the product (made fresh) still steaming, something our customers really love. They are easy to label, look clean, and seal tightly. They add less than $.10 to the cost of the product. 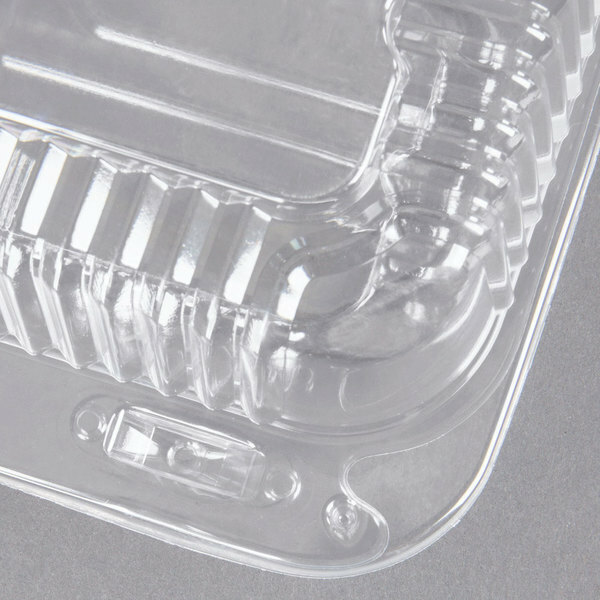 We have had numerous favorable comments from our customers regarding "your new packaging". We will definitely continue to use them. Wow this item is superb we use it for subs, just add a sheet of foil to keep it warm. Great presentation for all kinds of food as for wings, and cheese sticks too. 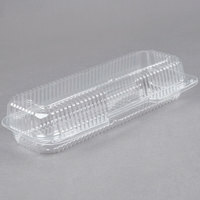 This is the only place I can find a container that actually fits a sandwich that is a foot long. Most of the ones we have found are too short. So we love these. Great price too! 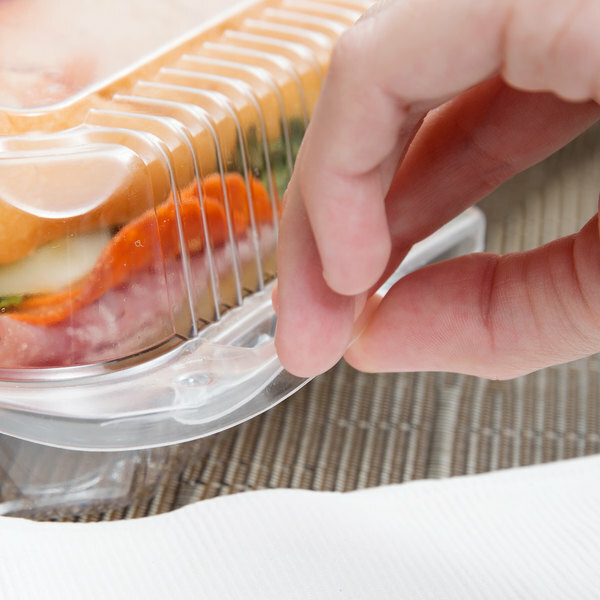 this is a great takeout container for a sandwich. it is a good product for a good price. they are easy to use and easy to store.